Solitary sailor is a simple nautical design I built in May of 2005. The initial concept has been expanded as clients have asked me to add pelicans, dolphins, lighthouses, rope borders, etc., to create many different other transoms. See the examples of these to the right and click on them to see their story. Solitary Sailor contains 60 pieces of stained glass and measures 12" x 30". Ann called me from Kansas and wanted to know if Solitary Sailor was still available. She said she had the perfect window opening for it. I offered to build a similar panel for her and we discussed some of the other variations of this design (on the right)..... but Ann liked the simplicity of this design and the fact that this was the original and not a later spinoff. 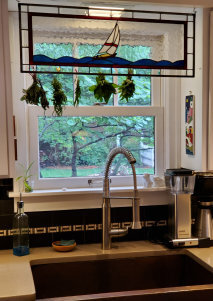 I shipped her the transom and she is displaying it proudly in her home in Lawrence, Kansas. She says pictures are forthcoming!